Hi Fi World mag. Good reading for hifi. International Times IT 131 UK Underground newspaper for July 1972. FN+. Condition is fine plus (FN : no creases or tears, staples shiny). Fine (FN) (5.5 to 7.4). Certainly no writing on the cover or tape repair, but there may be more stress creases and one or two minor, short creases. Silveracre has been dealing in the very finest comics and collectibles since 1988. CREDIT CARD. Cartridge group test etc. Hi Fi World Magazine Vol.16 No.11. Silveracre has been dealing in the very finest comics and collectibles since 1988. Don't worry, we will always get to you! Add us to yourfavourites list. WHY BUY FROM US?. It will normally be fine if we are notified in advance. Includes Audiophile Vinyl, Sugden, Leema etc. Hi-fi World mag. Examples of system building. This is edition number 23 with the headline Gay! in support of the Gay Liberation Front. 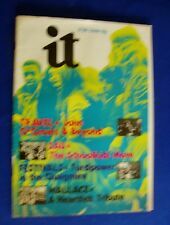 Rare copy of controversial underground Ink magazine/newspaper from 16th November 1971. GÉRARD DESARTHE : interview 4 pages, 2 photos "A Seraphic thug in the hell of the cinema". Jean-Paul Belmondo. "On the other side of Belmondo". N ° 1 (May 1983). 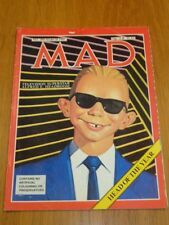 RARE MAGAZINE, complete and in very good condition!FRENCH MAGAZINE COMPLETE AND IN VERY GOOD CONDITION! (140 No.36) featuringVICTORIA WOOD upon it's cover. Magazine in mint/perfect condition. From Personal Collection. The image you see is the magazine you receive and is not a generic internet grab. Silhouette Issue 2. The golden age of corsetry. Of whales and underwear. 22 December. 18 December. 21 December. Mon 17 December Austria, Denmark, Germany, Iceland, Netherlands, Norway, Portugal, Slovakia, Spain, Switzerland. Tue 18 December Belgium, France, Ireland, Luxembourg. This is a readable disc containing the collected issues of Films and Filming from it's beginning in October 1954 up until December 1959. All issues are complete and the runs are intact with no issues missing. Month September. Year Published 2010. Mint Condition, Factory Sealed. Country/Region of Manufacture United States. Issue Type Monthly. (NATALIA VODIANOVA and JUSTIN PORTMAN : 6 pages, 8 pictures). The marriage of JEAN DUJARDIN and ALEXANDRA LAMY : 4 pages, 4 pictures). SHARON TATE : 8 pages, 18 pictures). THE little PRINCE (Saint-Exupéry) : 1 page, 2 photos. Films and Filming Magazine: PDF Format on DVD/DVR Disc. 1960 to 1964. This is a readable disc containing the collected issues ofFilms and Filming from it's beginning in January 1960 til December 1964. Good condition. Only available to subscribers. Issue 4, the Autumn 2008 edition features art by Amy Brown, Jean-Baptist Monge, Myrea Pettit, and Sally Jacob. Plus an interview with Faeries Wear Boots. International author, Diana Cooper talks about orbs, unicorns and faerie lights. This disc does not play in a regular DVD player, it is for your computer drive only. ON THE DISC From the late 1930’s to 1948 and issues from 1962. Don't worry, we will always get to you! Silveracre has been dealing in the very finest comics and collectibles since 1988. It will normally be fine if we are notified in advance. We accept all major credit cards. Fine (FN) (5.5 to 7.4). Certainly no writing on the cover or tape repair, but there may be more stress creases and one or two minor, short creases. Corners may be rubbed a bit. A well-read paperback or hardcover kept on an open shelf is often in this grading. Silveracre has been dealing in the very finest comics and collectibles since 1988. Don't worry, we will always get to you! CREDIT CARD. Films and Filming Magazine: PDF Format on DVD/DVR Disc. 1965 to 1969. This is a readable disc containing the collected issues ofFilms and Filming from it's beginning in January 1965 til December 1969. First of all let's get to know each other. Transliving is the world's largest and leading Transgender lifestyle magazine. It is an A4 format and full colour throughout. There will be no follow up unless requested by you! You are viewing an Official PlayStation Magazine 'Twenty Years of PlayStation' 20th anniversary magazine. blues and soul magazine issue 597 oct 1991. Condition is Used. Dispatched with Royal Mail 2nd Class Large Letter. This is for Issue 2 of CD32 Scene Fanzine. CD32 SCENE FANZINE - ISSUE 2 CONTENTS. CD32 Expansions Cards. Zerosphere CD32. Paper Type (Inside): Silk 115gsm. Paper Type (Covers): Gloss 250gsm. Size: A5 (148mm x 210mm, closed) / (296mm x 210mm, opened. ).